In 1912, 3,000 cherry tree saplings arrived from Tokyo to the city of Washington, D.C. Now over 100 years old, these trees blanket the Capitol in breathtaking color every Spring, drawing in millions of tourists from all over the world. Over the years, gifts have been exchanged between the two countries. In 1915 the United States Government reciprocated with a gift of flowering dogwood trees to the people of Japan. In 1981, the cycle of giving came full circle. Japanese horticulturists were given cuttings from D.C.’s trees to replace some cherry trees in Japan which had been destroyed in a flood. Also available stretched and ready-to-hang (for pick up only) at Gallery: $975. To purchase this option, please call the Gallery. SKU: N/A. 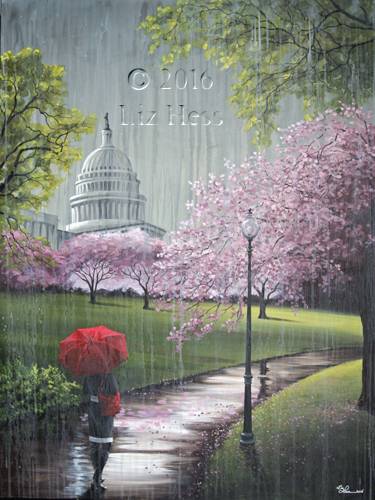 Categories: Available Originals, Red Umbrella Collection.